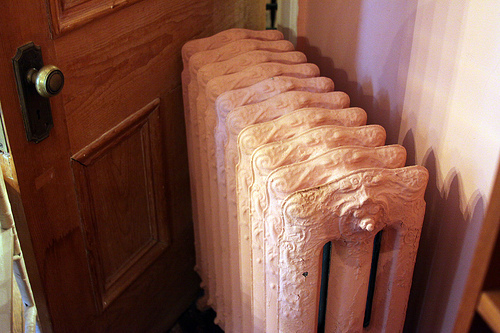 Photo of pink vintage radiator by theogeo/Flickr. Ah, the sweet sensation of radiators kicking off in the late fall and winter, bringing a reassuring wave of warmth to make your house all cozy. The perfect time to curl up with a good book and a cup of...wait, what’s that smell? While a bad smell from the radiator isn’t a good thing, it’s also not uncommon, and the cause might be a simple fix, so don’t panic. Here's a DIY guide to identifying bad radiator smells. Undesirable odors are most frequently noticed when radiators haven’t been run in a while, and the culprit is often just dust. If you aren’t the most scrupulous of housekeepers, dust can build up on and around the radiator over time. The first time it heats up after a few months of being cold, the dust will burn off, creating a distinct burning smell which should dissipate in a few minutes. If you have pets, you should also check behind the radiator for buildups of hair and dirt, and make sure to clean regularly back there. If your radiator is scrupulously clean, another possible cause of radiator smells is fresh paint. If your radiator (or the wall behind it!) was repainted recently, it can off-gas a bit when warmed up for the first time. This is also normal, although you might want to ventilate the room with a fan to help speed the dissipation of the odor. Brand new radiators will also produce some strong odors because of chemical residues left over from manufacturing; if these persist for more than a few days, talk to the installer or manufacturer about the problem. or, of course, obvious visible mold. Mold is seriously undesirable, so take care of it promptly, once you've fixed the leak. If your carpet is moldy, remove the affected section, check the underlying floor, and allow it to dry completely before calling a pro to replace the carpet in that area. If you have wood floors, regularly clean them to avoid standing water, especially around the radiators. Other flooring materials like linoleum and tile tend to be more mold-resistant, but even they could harbor mold colonies if the environment is too moist and too warm. In addition to causing health problems, mold can damage your home, and if it’s hidden in the underlying structure of the floor, you might not realize you've got a problem until your 200 pound radiator falls through! This article was updated December 3, 2017.